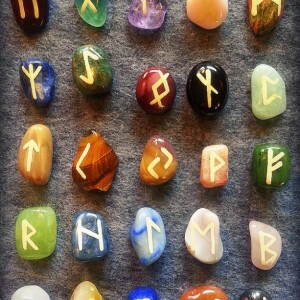 This set of runes is custom made. Please send me a message for lead time, and delivery dates, especially if this is a gift. (This item may or may not be crafted in time for upcoming holidays, so please contact me in advance to find out ship times. If it is not ready for your deadline, a gift-card and notification can still be sent to your recipient, letting them know that their special tool is on it's way soon.) 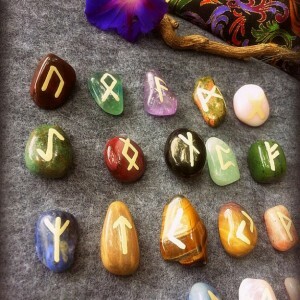 This listing is for a set of handpainted Elder Futhark Runes. 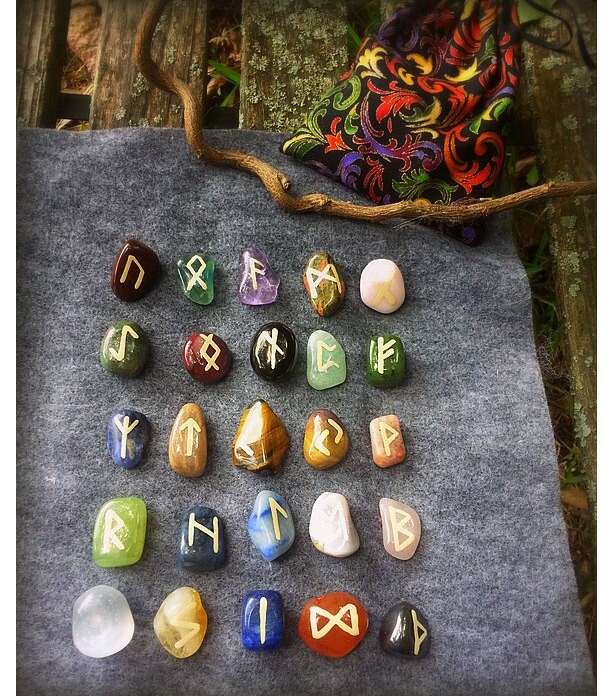 The set shown in the photograph is made from specially selected semi-precious gemstones, that reflect a quality or symbolism that goes with the rune. 25 stones/Runes are included in each set. 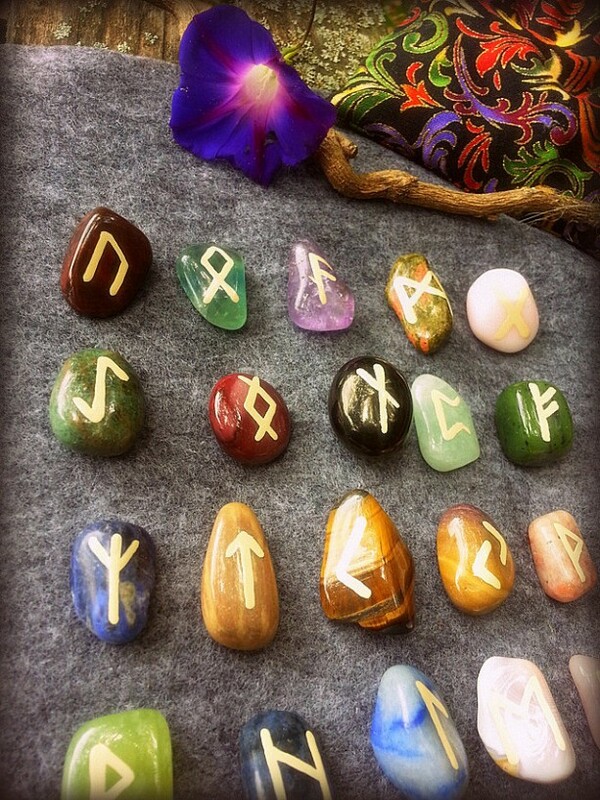 Each rune is carefully handpainted with artist quality oils. Each stone is roughly a half inch to inch in diameter. Size varies from stone to stone. A handmade felt casting cloth, and decorative bag is included in the set. Also included will be a pamphlet directing the buyer to books and websites recommended by Wax & Wane, on how to use runes for study, divination, and meditation. This purchase requires a bit of communication between the buyer and myself. I am a very quick, and easy crafter to contact, and I do many custom orders. 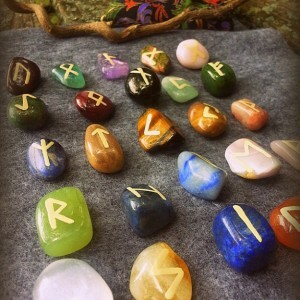 My Runes are also available in many gemstone options. I have the main multi-assorted set pictured here. Each set is made to order, and upon purchase, and you can message me to pick which gemstone you'd like your set to be made from, if you would like a uniform stone. Or you can have the set shipped just as pictured. Other possible Options are: (Shown in photograph above, listed from left to right, top to bottom:) Pink Lace Agate (or Rose Quartz, similar, light pink, not pictured), Red Fire Agate, Hematite, Petrified Wood, Jade, Blue Lace Agate, Lapis, Amethyst, Onyx, Carnelian or Citrine (similar, amber yellow and transparent, not pictured), Green Amazonite, or Moonstone. 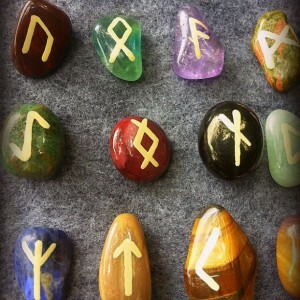 The color of the painting on the rune will be complimentary to the color of the stone. 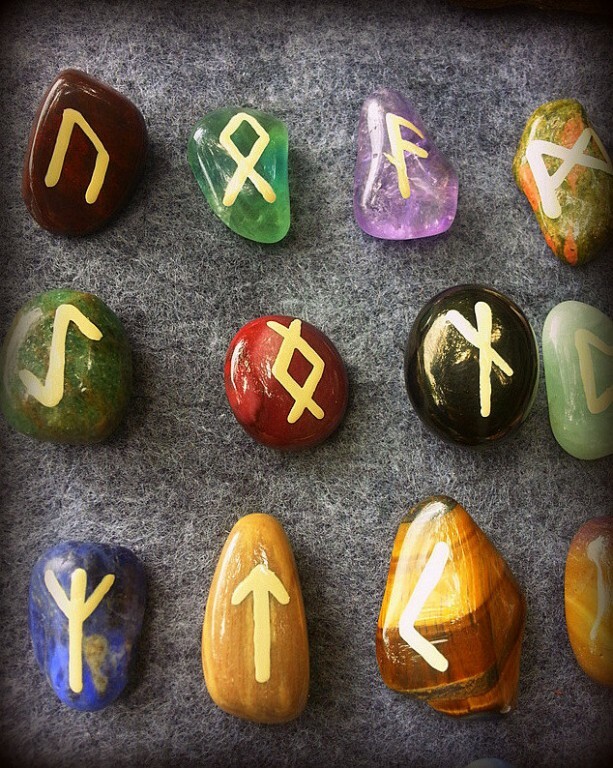 Or, if you wish, you may message me with the color of painting you would like on your rune set. Availability of stones may require a slight wait for your order to be filled, although I have a local, conscientiousness, and reliable source. I will communicate with the buyer if there are any anticipated delays. 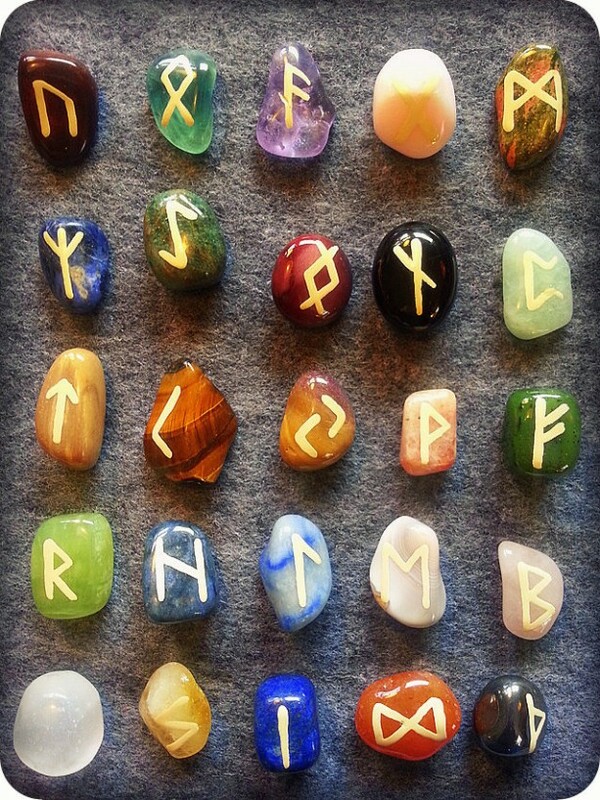 Also, every stone is unique, and every set of Runes are unique. So, variations in each stone and Rune set are to be expected. You are ordering a one of a kind, magical tool, made just for you!! The Elder Futhark (or Elder Fuþark, Older Futhark, Old Futhark) is the oldest form of the runic alphabets. It was a writing system used by Germanic tribes for the northwestern and Migration period Germanic dialects. Its inscriptions are found on artifacts (including jewelry, amulets, tools, weapons, and runestones) from the 2nd to 8th centuries. The earliest runic inscriptions found on artifacts give the name of either the craftsman or the proprietor, or sometimes, remain a linguistic mystery. 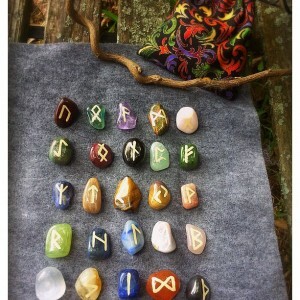 Due to this, it is possible that the early runes were not used so much as a simple writing system, but rather as magical signs to be used for charms. Although some say the runes were used for divination. Some later runic finds are on monuments (runestones), which often contain solemn inscriptions about people who died or performed great deeds. For a long time it was presumed that this kind of grand inscription was the primary use of runes, and that their use was associated with a certain societal class of rune carvers. The Elder Futhark, used for writing Proto-Norse, consists of 24 runes (and one blank rune that symbolizes the word of Odin himself...Wyrd, the Blank Rune, is a message to look to the inner self), that often are arranged in three groups of eight; each group is referred to as an Ætt. The earliest known sequential listing of the full set of 24 runes dates to approximately AD 400 and is found on the Kylver Stone in Gotland, Sweden. 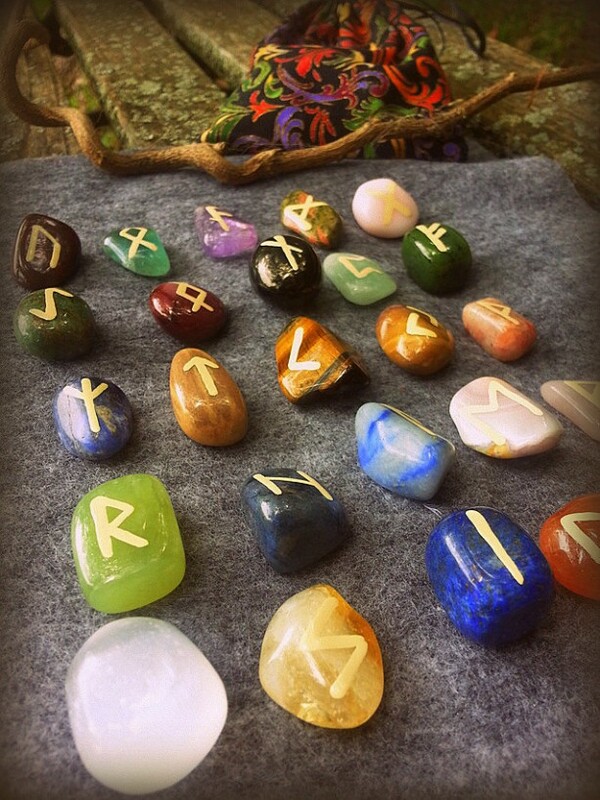 Most probably each rune had a name, chosen to represent the sound of the rune itself. Runic alphabets have seen numerous uses since the 18th-century Viking revival, in Scandinavian Romantic nationalism (Gothicismus) and Germanic occultism in the 19th century, and in the context of the Fantasy genre and of Germanic Neopaganism in the 20th century. In J. R. R. Tolkien's novel The Hobbit (1937), the Anglo-Saxon runes are used on a map to emphasize its connection to the Dwarves. GEMSTONE PROPERTIES: Agate: general protection and healing, increases courage, self-confidence, and energy and promotes longevity. Also good for gardening. Rose Quartz: great for attracting love. Promotes self-loving and heals emotional wounds as well as promoting peace, forgiveness, and nurturing. Hematite: great stone for grounding. Calms and soothes, reducing stress and blood pressure. Petrified Wood: earthy, grounding, great for the heart and the soul, connecting to past lives. Lapis: emotional healing and stability. High intensity stone which cleanses the spirit to bring out inner truth and peace. Onyx: good protective stone. Also releases old relationships and keeps away general negativity. Amethyst: increases vivid dreams, relieves depression, promotes calm, serenity, and spirituality. Helps with addiction and stress. Carnelian: uplifting, reduces tension and stomach problems. Citrine: helps digestion and aids in mental and intellectual functions. Increases self-esteem and energy. Balances and dissipates negative energy. Amazonite: helps clarify and improve thinking and generosity. Moonstone: helpful in psychic work. Opens the spirit to the feminine aspect. Draws love and helps in interpersonal relationships.